Today, am going to introduce you to a new brand, Juicy Chemistry. The name itself looks tempting no? I loved Chemistry during my school days and always scored well in that. I used to love the Organic Chemistry chapters especially. Remember benzene structure and CH3COOH formulae? 😄 I hated Physics though, mostly because I didn’t understand half the things. Well coming back to Juicy Chemistry, all their products are made with natural ingredients – free from parabens, phthalates, and sulphates. They are against animal testing. All their products are biodegradable and made with natural ingredients that pose no risk to the water ways, marine life, and human health. 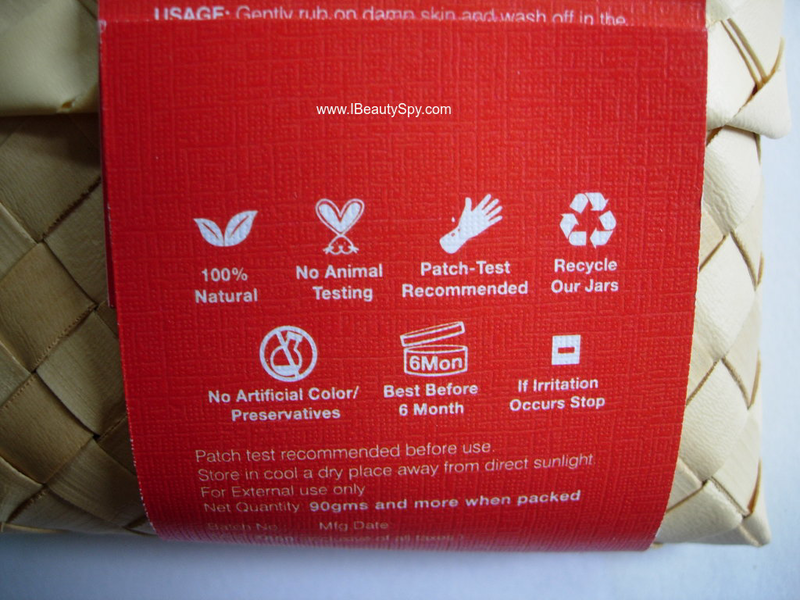 Their products are minimally packaged with recycled and recyclable materials. They use organic ingredients for all products sourced from trusted and certified suppliers. By drawing inspiration from nature, and understanding the power of its rich flora, we help create the perfect chemistry between you & nature. Our unique formulations are designed in house and every ingredient earns its place to achieve a specific result. We carefully mix our ingredients in precise quantities and make our products in small-batches to ensure maximum effective shelf-life. Each product is handcrafted with the finest local produce and organic essential oils, to make your Juicy Chemistry experience a sheer indulgence! Products such as Omega Boom contain Omega 7 that are essential fatty acids that help to make the skin healthier. To know more about their story, check here. To know more about how they source their ingredients, check here. Our hand-crafted soaps are made using traditional cold process methods and contain a high percentage of nutrient-rich oils, fresh carrot juice, organic botanicals, exfoliating adzuki bean, and ultra-moisturizing butters. 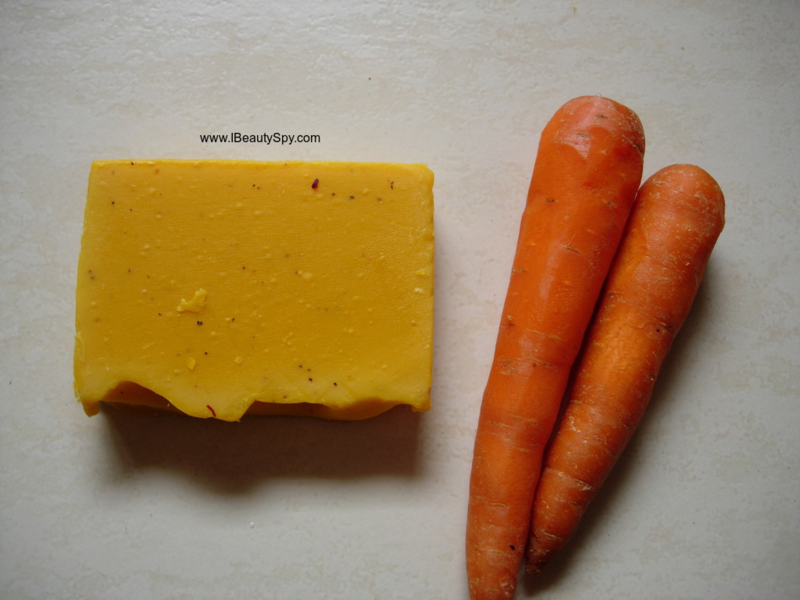 The powerful healing and anti-oxidant properties of carrot are harnessed in this soap with a blend of essential oils. Scrub yourself, and tell yourself that this counts towards your five-a-day! Gently rub on damp skin and wash off in the shower. Ensure that the soap is drained well after use. 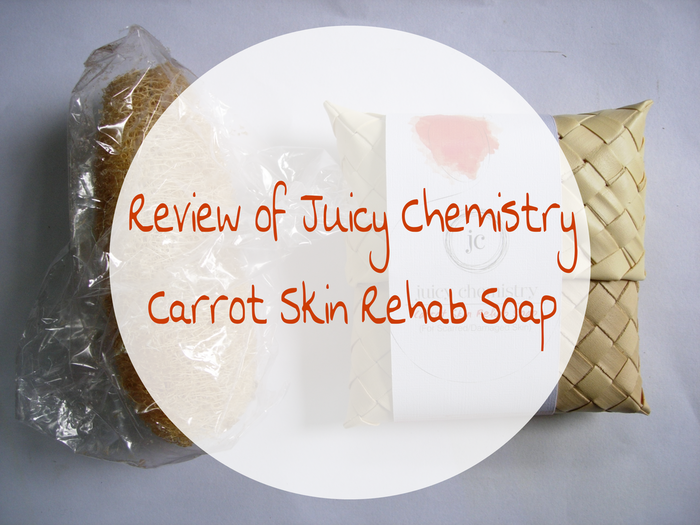 I love handmade soaps and when Juicy Chemistry sent me this Carrot Skin Rehab Soap along with a natural loofah, I was super happy. The soap is specially meant for scarred/damaged skin. 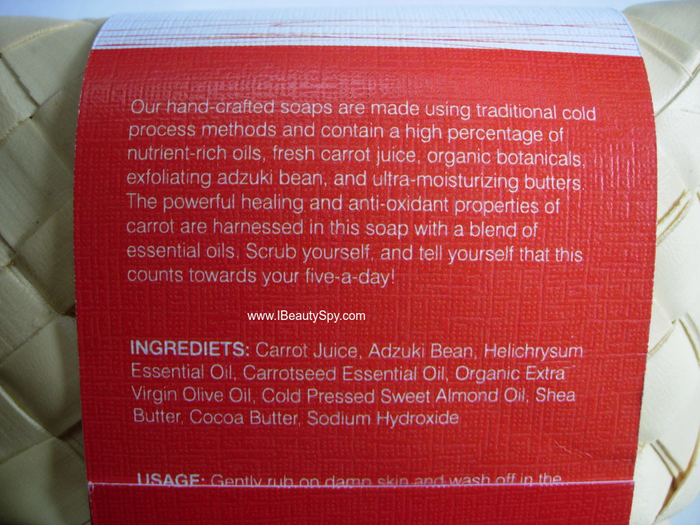 The soap contains a whole lot of impressive ingredients. To know in detail about the goodness of each ingredient, check here. The packaging came in a superb hand weaved pack as you can see in the pictures. Its recyclable and its really cute how they have designed it. I love carrots and anything made with carrots – gajar halwa, carrot kheer, carrot juice. When I received this soap, it looked exactly like solidified gajar halwa. I mean the color and texture. Only the saffron strands were missing. I couldn’t wait to try it out. Who wouldn’t like bathing in gajar halwa! However, on using it, I realized it didn’t have a sweet base, but rather a warm, spicy scent. Being a warm scent lover, I don’t have anything to complain. But still my imaginations of bathing in kesar gajar halwa was gone! The soap is yellow in color and has mild scrub particles of adzuki beans. Adzuki beans are the common red beans (cowpea beans) that we use in cooking. These scrub particles help in mild everyday exfoliation. The soap lathers moderately. And the fresh, spicy scent lingers on you for sometime even after bathing. It makes the whole bathroom smell fresh! After drying, I can feel my skin cleansed, smooth and soft. Thanks to the goodness of various oils and butters. Once you start using these handmade soaps with loads of goodness, trust me, you will never go back to your regular drugstore soaps. They are harsh on the skin and dry out skin excessively. With this soap, I have skipped moisturizer many times, yet still didn’t feel any dry, stretchy feeling and my skin was nourished. Also, I had some back acne and the soap was very effective in curing them as stated in the product claims. The soap doesn’t melt much unlike other handmade soaps and retains its shape. I use the loofah twice a week along with the soap for deep exfoliation. The loofah is made of natural plant fibre and is skin-friendly unlike the plastic loofahs we get in the market. The price is surely expensive for a soap. It is of high quality, I can agree for sure. But still I wish it were around Rs.300 – 400. It is one of the most expensive soaps I have ever used. Juicy Chemistry also offers international shipping, so if you are living abroad too, you can take a look at their website and order a bunch of products. Yes, it satisfies all its claims. It treats acne, exfoliates and cleanses pores, soothes itchy skin, retains moisture, nourishes and conditions the skin. * Cleanses skin well without drying it. * The various oils and butters provides nourishment and conditions skin. * Free from parabens, phthalates, and sulphates. * Very expensive. Reduce the price to Rs.300 – 400. Yes, if you can invest in it. Availability: You can buy online from here or here. Though I didn’t have a sweet gajar halwa bathing experience, nevertheless the soap really impressed me both with its effects as well as the warm, spicy scent. Its really expensive. But considering all the nourishing natural ingredients put in it, it is worth a shot. 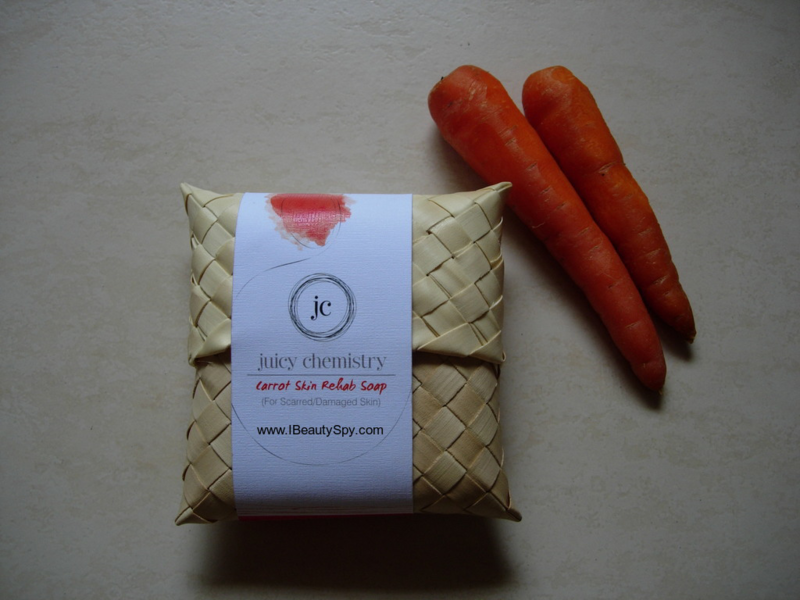 Have you tried any Juicy Chemistry products? Do you like handmade soaps? Share your experiences in the comments. The soap sounds promising..wish the price was lower. Great review. Nice review , the product seems good and worth trying but bit expensive . Yikes that is a very hefty price tag. Seems like a good one but price is definitely a con! Recently Posted: Jovees Premium Sunscreen review ! It was really a detailed review! Helping one…. I think it’s expensive for a soap but I won’t mind trying it as long as it’s natural and organic. The price is justified. It looks tempting! Thanks for the review! Wow.. This is truly worth a try! Thanks for the review.